GENUINE FROM ISMOKA ELEAF NOT A COPY. Eleaf iStick 50W Sub Ohm Battery is a super upgraded version based on iStick series batteries. Powerful vapor can be generated due to the expanded range of output voltage(2V-10V)/ wattage(5W-50W) with massive 4400 mAh battery capacity. It retains strong spring connector and wear-resistant stainless steel thread. Moreover, the additional temperature alarm function makes it high-safety even in strong vaping. Great feeling when you hold it because of its size and the rounded edges, while side charging port is also a plus. Eleaf iStick 50W Sub Ohm Battery is truly beautiful - this is the battery only at an amazing price. Works fantastic with either a Aspire Nautilus Mini - or a full size Aspire Nautilus as well the sub ohm Kanger Atlantis Mini. All these tanks are in stock at Electronic Cigarette World, Australia ready for quick delivery. Eleaf iStick 50W Sub Ohm Battery is an absolutely amazing setup capable of delivering the most amazing vaping experience. 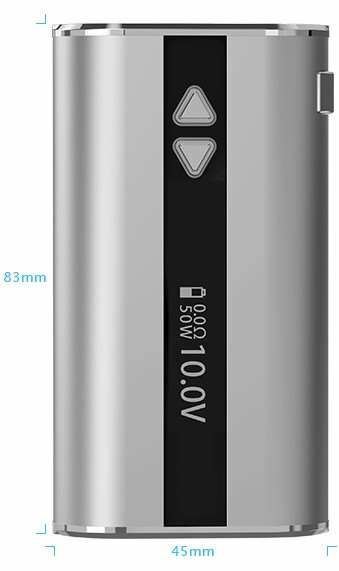 The Eleaf iStick 50W Sub Ohm Battery is capable of a maximum 50W Output, with a voltage range of 2-10V. It is capable of firing down to 0.2 Ohms, making it handy for the new breed of Sub Ohm Clearomizers like the Aspire Atlantis 2 and Kanger Subtank Mini. The Eleaf iStick 50W has multiple protections such as atomizer short circuit protection, over 10 second protection and low voltage protection. Temperature Alarm function: If the temperature of device is over 70c, the output will shut off automatically and the screen will reflect "Temp Protection" for 5 seconds. Spring Connector and Stainless Steel Thread: The spring connection base ensures its high adaptability. The connecting thread is made of stainless steel which makes it more hard-wearing. Inherent Advantages of iStick Series: OLED display, adjustable voltage/wattage and arrow button lock function. Adjustable Voltage: Press the up-and-down arrow buttons to increase/decrease the working voltage between 2.0V to 10.0V.